Committee members fretted about the appearance of privatizing of the VA in giving veterans an option to turn to community providers for timely care, the VA’s cost of which has risen dramatically with higher usage. Rep. Phil Roe, MD (R-TN) said the value of the Cerner contract alone in the VA’s EHR project will be $10 billion, not including infrastructure and VistA maintenance costs. Rep. Roe questioned whether it will ever be possible to turn VistA off. He thinks it will need to run for many years for looking up information that can’t be converted to Cerner. Sec. 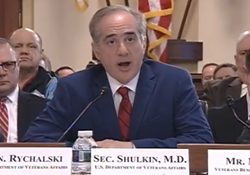 Shulkin said he paused the project to make sure that the VA can exchange information with community providers, as 36 percent of veterans are getting care in the community. He said the American healthcare system hasn’t yet figured out interoperability, but the VA can lead the way. Rep. Jim Banks (R-IN) questioned the rollout of a scheduling system given that the pending Cerner project has “run into trouble.” Sec. 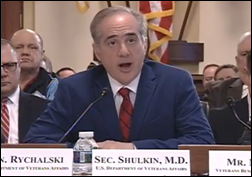 Shulkin said the VA’s Epic scheduling project (MASS) pilot will go live in Columbus, OH in March and the VA is looking forward to seeing how it works. Commercial scheduling products are being tested at three other sites. From Ticklish: “Re: opioid crisis. This article says it’s caused by a lack of interoperability. Think so?” Of course not. Short-sighted healthcare people forget that prescribed, FDA-approved opioid drugs make up just part of the available smorgasbord of narcotics, and in fact, their higher cost and reduced availability is pushing users to cheaper, more easily obtained forms that doctors and hospitals don’t control. I’m not convinced that anything can stop the use of drugs by determined people, but if there is a magic bullet, I’m certain it isn’t prescription databases, cracking down on supply, or mass incarceration. And while everybody was focusing on Oxycontin, crystal meth usage has returned with a vengeance lately with purer, cheaper product available everywhere, so now there’s that massive scourge to deal with again. Our real problem is that a huge chunk of our society (one in seven, according to the Surgeon General) finds living in an un-medicated state intolerable, apparently not really caring whether their minds are altered by depressants (including alcohol), stimulants, or both. That massive demand and the associated profit will assure a steady supply that can’t be stopped, even by admirably trying to contain opiate over-prescribing. 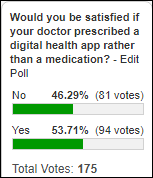 Digital health apps already have challenges with proving their worth, but here’s another problem: half of poll respondents – presumably most of them being health IT experts — wouldn’t be happy at having an app prescribed instead of a medication. Maybe the unstated problem is that the mental picture of a “digital health app” is a patient portal, activity tracker, or record-keeping system instead of an FDA-approved treatment that delivers proven outcomes. New poll to your right or here, as suggested by a reader: What impact would a job candidate’s CPHIMS credential have on your hiring decision? Long-time readers may remember that I asked this same poll question way back in 2009 and 2010. Readers weighed in on “What I Wish I’d Known Before … Going to my First HIMSS Conference as an Exhibitor.” This week’s question: what do you wish you’d known before taking a travel-heavy job? Welcome to new HIStalk Platinum Sponsor Wolters Kluwer Health. Every health professional knows their medical evidence and technology brands – Lippincott, Ovid, UpToDate, Medi-Span, Health Language, PharmacyOne Source, and Emmi. Those products deliver clarity when and where it’s needed most, driving better care decisions and consistent outcomes across the care continuum. Its “Eyes Wide Open” report provides practical ways to improve healthcare delivery and outcomes. Thanks to Wolters Kluwer Health for supporting HIStalk. Listening: new from Superchunk, angry protest poetry cloaked in masterfully crafted indie punk-pop. The Chapel Hill, NC band has never lost its relevance or fierce independence, and to my ears, has never sounded better. I saw their frenetic but somehow simultaneously laid back show live awhile back and was most struck by a fan’s shouted request for some non-Superchunk song, with the laughing reply of guitarist Jim Wilbur being, “Mac [McCaughan] won’t sing any lyrics he didn’t write, so that’s not going to happen.” That’s admirable. President Rick Poulton touted the company’s acquisition of McKesson’s EIS business and Practice Fusion, saying that they give the company hundreds of new client relationships; fill several EHR portfolio gaps; create a large, actionable patient data set that life sciences and payer companies will pay for as they did under Practice Fusion; and add $300 million in annual recurring revenue, all for a net investment of $50 million. The sales cycle is lengthening and customers are looking harder at return on investment. End-of-life of the former McKesson Horizon Clinicals and Series 2000 product lines is March 31. The company is pitching its DbMotion to the VA as it transitions over several years to Cerner or whatever vendor it chooses. Allscripts declined to say how much Hyland Software is paying for the former McKesson OneContent content management business, but the Allscripts SEC filing seems to indicate $260 million plus assumption of certain liabilities minus other financial adjustments. 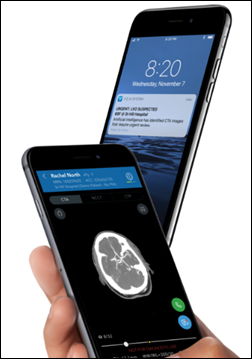 FDA approves the marketing of Viz.AI’s AI-powered CT scan analysis to notify providers quickly of a possible patient stroke for direct intervention. Adventist Health hospitals in California will shift 1,200 IT and revenue cycle employees to Cerner, according to layoff notices filed with the state. Presence Health (IL) chooses R1 for RCM services and will transfer 1,000 of its employees to the company. St. Charles Prineville Hospital (OR) will go live on Epic in April 2018. Lake Forest Hospital (IL) will go live on Epic on March 3, 2018. McLaren Oakland (MI) will go live on Cerner in late 2018 or early 2019. Orlando Health (FL) hires Novlet Mattis (Ascension Information Services) as CIO. She replaces Rick Schooler, who retired in September 2017. 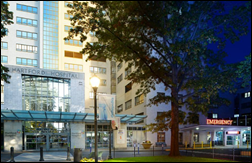 Hartford HealthCare (CT) reports that its use of Stanson Health’s clinical decision support prevented 250 unnecessary transfusions in 45 days, providing an annualized $1 million in savings. Columbia Basin Health Association (WA) goes live on Versus Advantages RTLS patient flow solution in its new outpatient clinic. Research network TriNetX develops an algorithm that can deduce the line of chemotherapy treatment a patient is undergoing, helping biopharmaceutical researchers develop new therapies. A security researcher reports a SQL injection vulnerability in Epic’s MyChart, also noting that Epic was “quick to respond to contact and patch the vulnerability.” That’s commendable – software vendors rarely behave nicely (and often threateningly) toward strangers who are nice enough to warn them of security flaws in their products. I don’t know how Epic notifies customers and distributes the patch, but I assume it will be quick now that any interested hacker could theoretically exploit it. For non-techies, SQL injection is an old hacker’s method in which they paste an SQL statement into a web page input field – such as name or city – that the web page then executes, giving the hacker access to the underlying database (read, update, delete) without having to pass through the site’s authentication. The CEO of Medical Center Health (TX) tells the board that its Cerner implementation is one of the organization’s most pressing issues, explaining, “This was an attempt to find an ideal system. That is not a possibility. There is no ideal electronic medical system.” He says he’s worked at hospitals that use Meditech and Epic and those products have the same problems. He says Cerner blamed hospital clinicians and administrators – “pretty much everyone except themselves” – for not implementing the system correctly, but says the hospital and vendor are now working together and Cerner is providing consultants at no charge. The hospital expects the implementation to come in at $47 million, $7 million under budget. 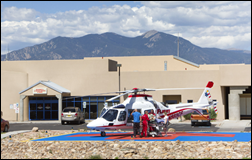 The financially struggling, 47-bed Holy Cross Hospital (NM) says its problems are due to a problematic software rollout, its conversion to a critical access fee structure, Medicaid payment delays, and a lawsuit judgment that raised its malpractice insurance by $600,000. The hospital didn’t name the system, but they started conversion from Meditech Magic to CPSI Evident last fall. The CEO said in his presentation to county commissioners last week that he should have delayed the October 1 go-live, but realized that many of the 100 on-site vendor support staff would be unavailable for a later date. He also says he regrets conducting the critical access switch and EMR conversion nearly simultaneously, but the hospital’s underlying financial problems were in place long before either. A Miami pediatric surgeon is charged with unlawfully accessing a computer when his former girlfriend finds out that, while they were dating, he logged in thousands of times to the streaming video feed from her in-home security cameras using hospital computers. He says she gave him the password, he was just checking into her well-being, the two cameras were not the bedroom, and she didn’t complain until they broke up and he declined to pay her the $400,000 she demanded. I like seeing a rare non-stuffy, HIMSS-related vendor press release. Cybersecurity services provider Lunarline says it is “planning for a wild HIMSS 2018,” explaining that, “Our sales team somehow convinced the conference organizers to let us serve beer at our booth. Because, you know, there is never enough alcohol in Vegas.” The company’s website is mostly dry and unremarkable, but a few glimmers of wit shine through. The reported go live date for McLaren Oakland is wrong. There are no dates set for activations for any locations. Posting for a friend. I give him due credit for the pause, but to talk about leadership when VA is at least a decade behind the times (and about to board the slow train) puts his credibility at risk at an already-tough time. Veteran – can you clarify what was “fake “? Was something made up (definition of fake) or did you disagree with Vaporware saying VA is way behind and Shulkin (already under fire) risks credibility?